We spent much of last week conducting sea ice stations northwest of Barrow, experiences you’ll hear more about in future posts. 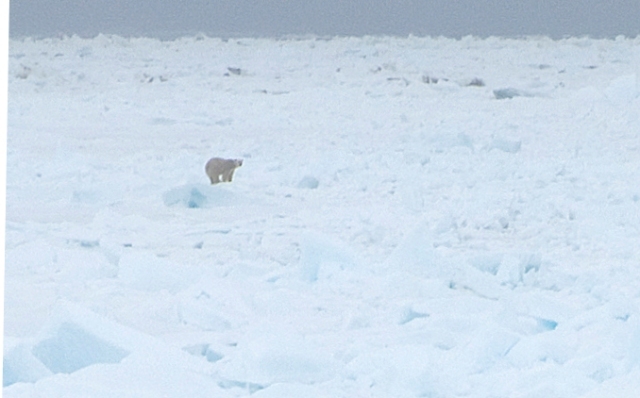 Two of the most special moments rippled as pipes over the loudspeaker: “Now, polar bear, starboard bow. Now, polar bear, starboard bow.” Indeed the Healy is passing through the Chukchi Sea, one of the only regions of the United States where polar bears live. Scientists refer to animals like polar bears, whales, and sea turtles as “charismatic megafauna” because they easily capture human hearts. As the largest living land carnivore, the polar bear reigns at the top of the Arctic food web. Polar bears are solitary, migratory animals that move with the sea ice rather than establishing territories. Like walruses, they follow the ice edge, where small soft protrusions (papillae) on the soles of their feet help them grip the ice to prevent from slipping. Polar bears’ semi-webbed front paws allow them to swim for hours— hence their scientific name, Ursus maritimus, or “bear of the sea.” The hollow guard hairs of their coats repel water quickly while swimming, and fill with air to act as insulators. Blubber beneath a layer of underfur also keeps polar bears toasty. Only pregnant females hibernate in dens during late fall and winter, and give birth to 1-3 cubs that remain with their mothers for about three years. However, global warming threatens the Arctic polar bear population, estimated to be about 25,000. As sea ice melts earlier and forms later, polar bears have less time to hunt their primary prey, ringed and bearded seals. Pregnant females are particularly vulnerable to the shorter hunting season, because with less food they enter their winter dens thinner than usual with less fat reserves for fasting. And of course, as the Arctic ice cover retreats, so does polar bear habitat. Polar bears must exert more energy as they travel from ice floe to ice floe in search of food; migrate further north with the retreating ice; or even move to land for a period of fasting without their seal prey. The listing prompted legal responses from a variety of entities. Because the state of Alaska stands to benefit from developing natural Arctic resources like offshore oil and gas in polar bear habitat, it filed a lawsuit in August 2008 to oppose the listing. In October 2009, the U.S. 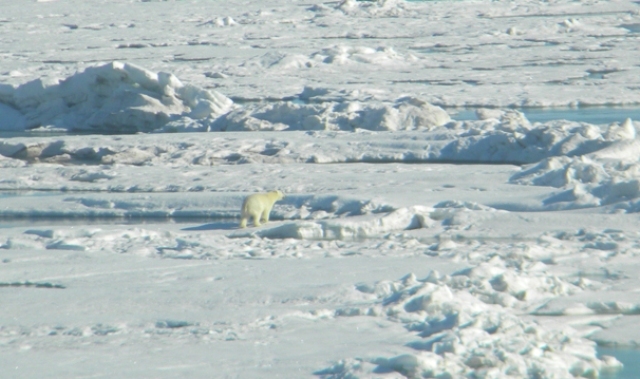 Fish and Wildlife Service proposed to designate about 200,000 acres primarily in the Beaufort and Chukchi Seas as polar bear “critical habitat” where species protected under the Endangered Species Act cannot be harmed. A decision has yet to be reached. As polar bear politics continue in Washington, those of us on the Healy lucky enough to glimpse them will never forget the excitement of jumping out of bed or interrupting lab work to rush to the starboard bow. For more polar bear information, visit: http://pbsg.npolar.no/en/index.html, http://www.biologicaldiversity.org/species/mammals/polar_bear/index.html, and http://alaska.usgs.gov/science/biology/polar_bears/tracking.html. Could shrinking habitats and warming temps cause psychological aberations –thus making it possible for Polar Bears to become bi-polar? shits awesome, wait.. who cares? It is great to see these magestic animals in there natural environment, great pictures, you are so lucky to be able to see such a wonderfull sight. Are there any stats yet on how many polar bear deaths are related to some of the problems you mentioned they face due to warming temps? I didn’t know well, I had an idea of the nomadism of these animals, polar bears, but not as this manner so well explained. I believe these animals are special. His white skin, the context and the study based on the ice white and polar bears too. how i wish i could also see some real polar bears in action by myself.